On the afternoon of the 2nd December 2015, Sammy Colburn, a member of the XRT-C science team, and I met up in the lab with one goal in mind: to figure out the optimal arrangement of amplifiers and filters for the signal chain from the dish to the receiver. This is a delicate process that really can make or break a project. Because of this, it is of vital importance to optimise the order in which we chain our amplifiers and filters. By using a few important pieces of physics, which I shall go through later in this post, we were able to accomplish our task. What we can ascertain from this table is that, as suggested by the name, the Low Noise Amplifier (LNA) causes much less noise in the signal path than the other amplifiers. We can use these figures to quantitatively determine the optimal signal chain with knowledge of the Friis equations. From this equation we can analyse the behaviour of this system. The most important finding of this analysis is that you should always endeavour to have a low noise amplifier as the very first stage in your chain. The immediate signal boost straight from the feed horn will give you a huge advantage that will ripple back the chain. It is also clear that there are rapidly diminishing returns to amplification stages later in the chain, as the characteristics of the chain are largely established close to the signal source where the noise factors mount up quicker. A final point to note is that the application of amplifiers further down the chain can interestingly be detrimental to SNR, so there is a fine balance to be struck. With this in mind we’ve decided on the optimal chaining for our system. This shows the electronics chain from the feed horn to the receiver. After analysing equations, we came to the firm conclusion that the above configuration would be optimal for our needs. The feed horn is mounted to the supports at the prime focus of our dish. We should attach the low noise amplifier directly to the output of the feed horn. This will give us the gain we desperately need when observing faint astronomical objects. We will then run a low noise cable down the dish to the floor where there will be a weather-proof box containing the filters and any extra amplification stages that we may require. Theoretically, extra amplification stages will be detrimental to the signal, but we will assess this again when the whole setup is in-situ at Caradon. At this point we pass the signal through a filter which performs a hard pass on only a very limited wavelength range (1350-1450 MHz). After this stage the signal will pass down a much longer cable from the dish to the receiver in the control room. For this setup to succeed we have to run a 12v power supply to the LNA on the dish. Chris Brunt, who has been advising us throughout this project, suggested a plastic band around the feed horn which would hold the power cables in place. This is ideal as it will cause much less stress on the connections of the LNA and allows for some much needed cable management. In this picture you can see the University of Exeter feed horn. The orange band around the top is the fixing that holds the power cables in place for the LNA and noise source (if required). Atop the feed horn is the noise source that we used for testing our chain. Hanging off the left of the feed horn is their low noise amplifier attached directly to the output; similarly to the desired configuration of ours. 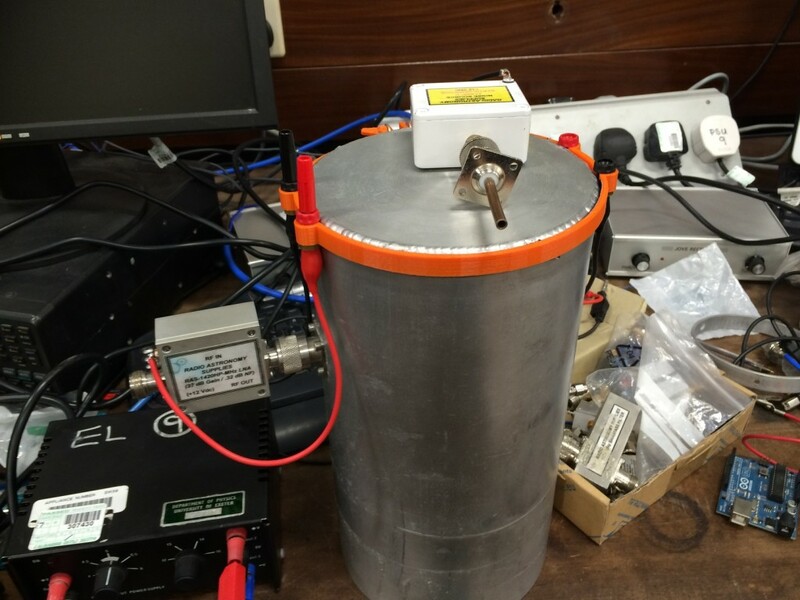 To test this configuration, we assembled it in the lab attached to the receiver and computer that are going to be used at Caradon. 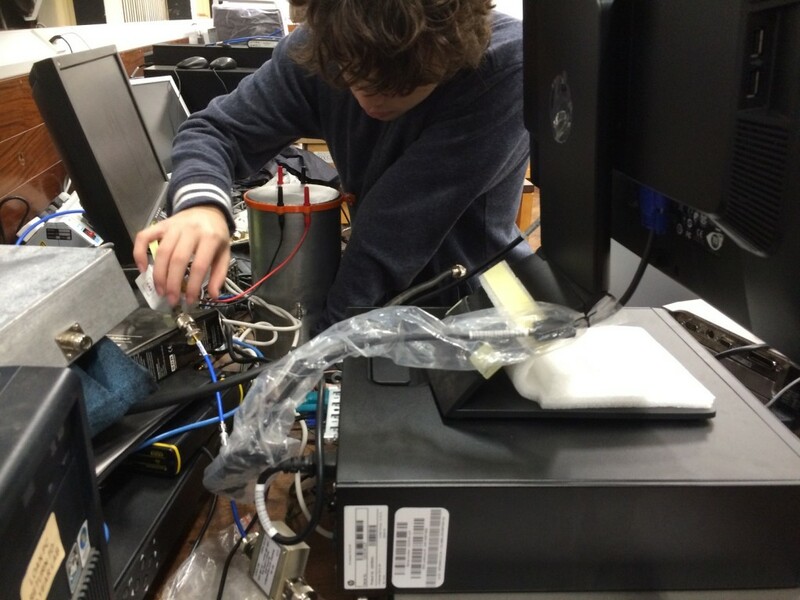 Here we can see science team member, Sammy Colburn, preparing the signal chain to begin testing. Pictured at the bottom of the image is our LNA. The filter is unfortunately being covered by the VGA cable between the computer and monitor. To test the signal throughput, we first covered up the feed horn with a metal plate, then removed it so it could receive background radiation, and then applied a noise source to it so we could get an idea of the signal to noise ratio of the electronics. 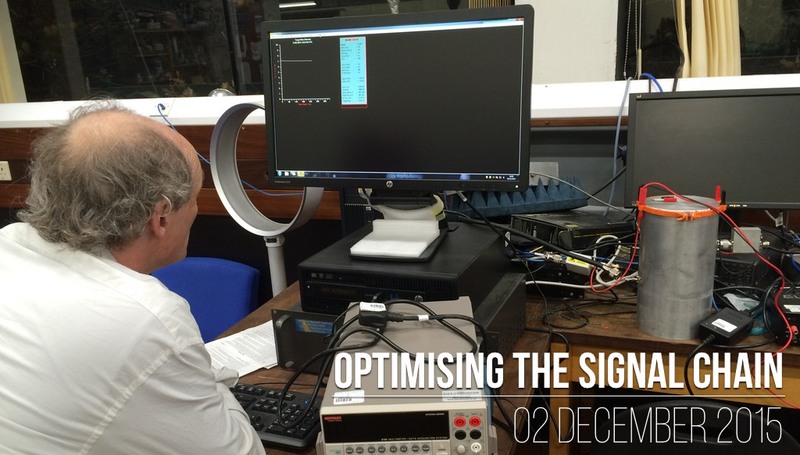 The noise source can also later be used as a calibrator during commissioning. This video shows the first test of the setup. When the plate is taken off we can see that the background noise is visible, peaking at $~5.5$V. When the noise source is applied to the feed horn the signal once again shoots up to 10V where it nearly saturates. This indicates a good SNR throughout the signal chain. There was one issue that was raised at the time of this experiment. How does the voltage scale in the software actually map onto the signal being received? After an email from Carl Lyster at Radio Astronomy Supplies, who we bought our receiver from, we found that the 0-10 volt scale represents about a 20dB dynamic range when the DC gain is set to 1, which ours was. In this test the noise source was held above the feed horn, but in reality for calibration you would mount it either inside the feed horn or attach it directly to the electronics. A concern that was raised by Chris is whether the noise source would cause damage to the equipment if it were attached directly, considering it was already saturating when being held away from it. Jeff put these worries to rest as he said that the preamp in the receiver can withstand at least 0.1 watts of signal, so the noise source should be okay. Overall, this was a successful afternoon in the lab. We’ve not only managed to pin down an apparently successful signal chain and ensure that it works as it should, but we’ve also managed to pin down some of final bits and pieces that we need to purchase and manufacture to finally put the telescope together. I would like to extend a massive thank you to Dr. Chris Brunt for being an invaluable help throughout this process, particularly for his insight into signal chain construction, and to Carl Lyster at Radio Astronomy Supplies for his advice.